www.photomacrography.net :: View topic - What can you tell me about this inspection microscope? What can you tell me about this inspection microscope? 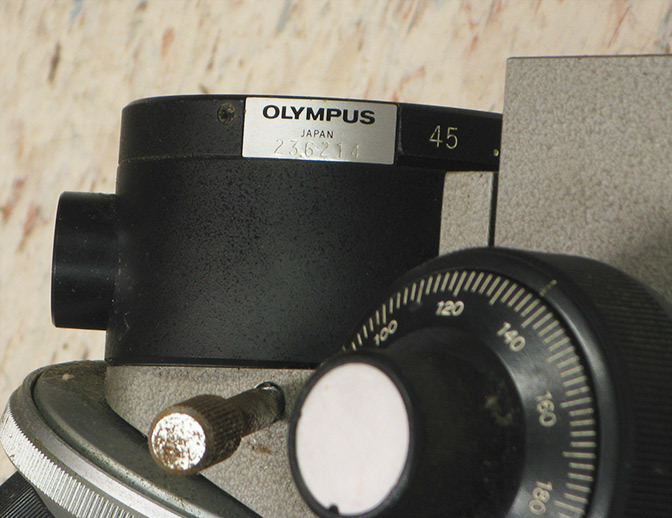 Posted: Fri Aug 14, 2015 9:09 pm Post subject: What can you tell me about this inspection microscope? This device showed up in one of my standing searches on eBay. I was interested enough to place a bid, and somewhat to my surprise I got it for a good price. I recognize most of the pieces, but I'm curious to know if somebody can tell me more about the whole assembly. 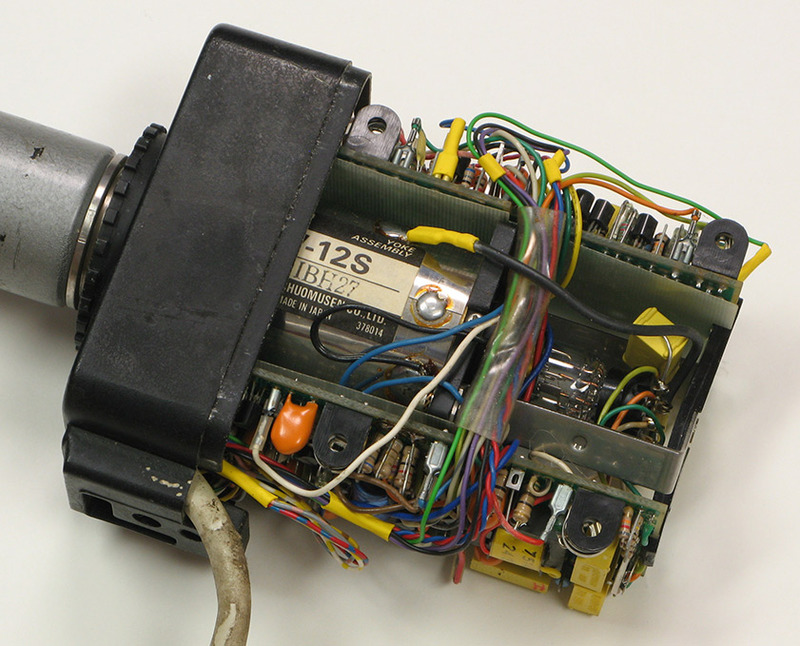 The unit consists of an Olympus BHMJ focus block and turret, an Olympus vertical illuminator (possibly BH-MA but without the filter slots, magnification selector lens, or diaphragms), a phototube (containing no optics), and what appears to be a very old and unlabeled vidicon style TV camera, all mounted on a base with a V-grove mount that appears designed to slide on something, and equipped with screw drive fine positioning slides (crossed roller design). Whatever more anybody can tell me, I would greatly appreciate hearing -- thanks! 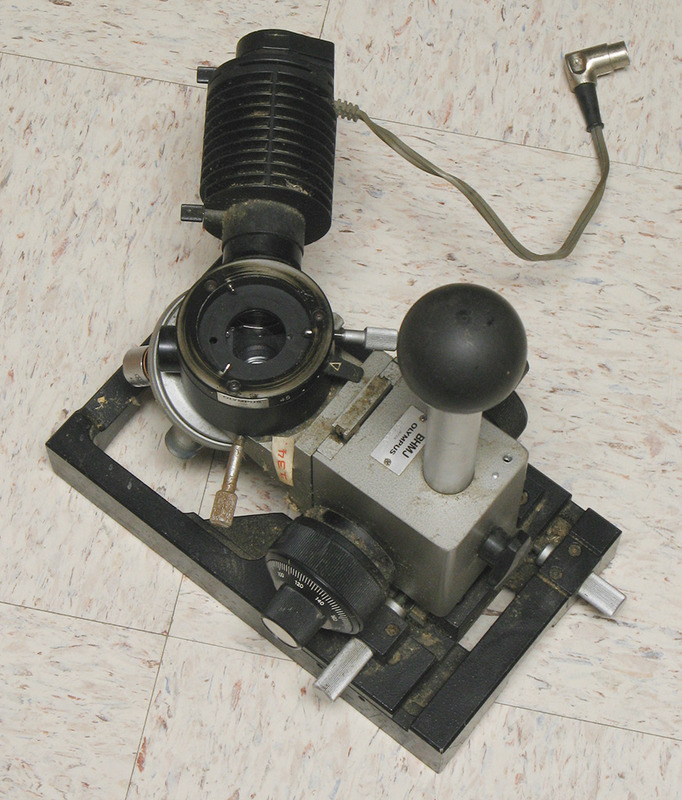 A portable microscope, similar to the Unitron Rollscope for inspecting large diameter printing rollers and and other large diameter cylinders. 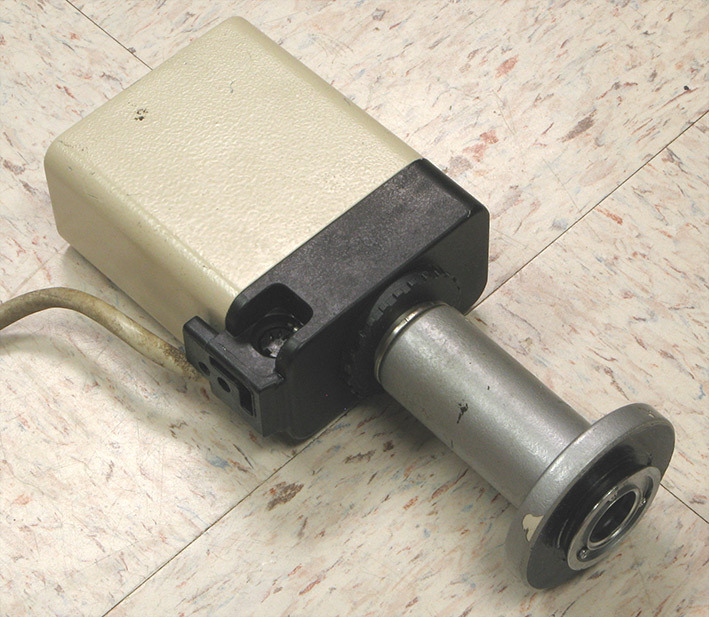 Not nearly as well thought out or constructed as the Unitron, which was completely portable, housing the illuminator batteries in the roller feet. Thanks for the info -- most appreciated. 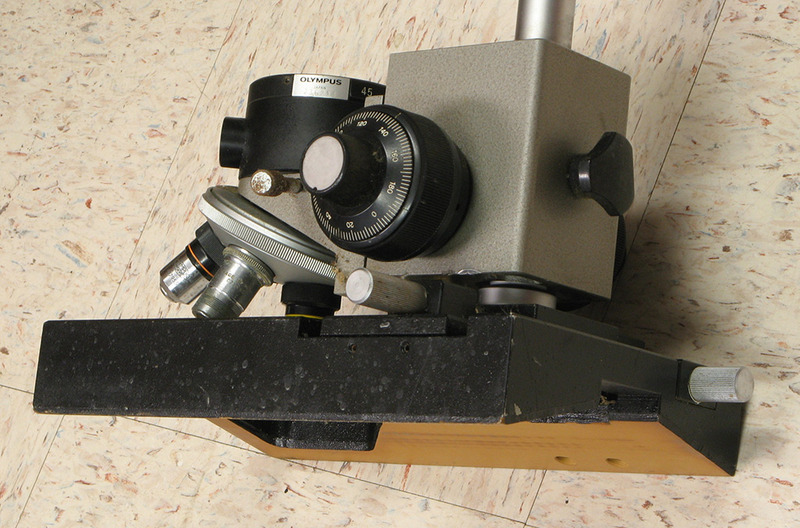 The device has cleaned up pretty well, except that there's one bit I haven't touched: the beamsplitter mirror. 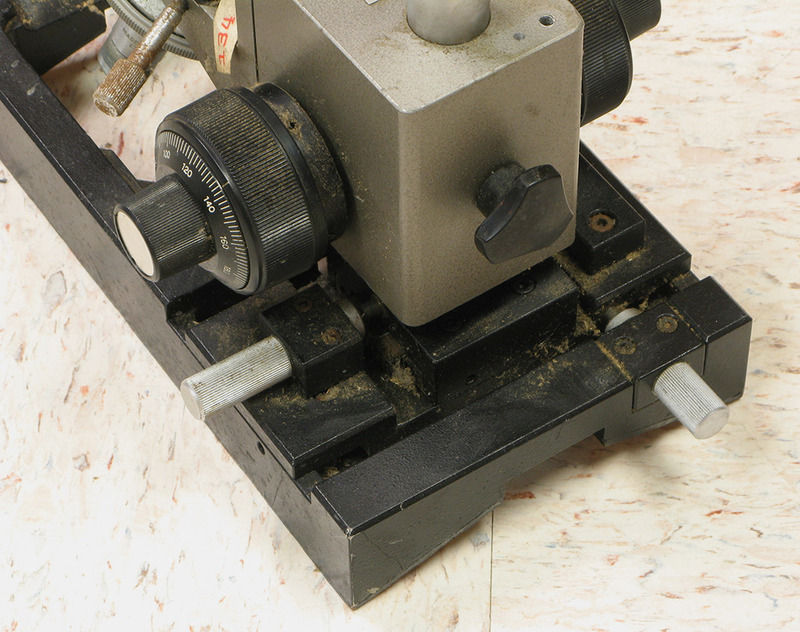 The beamsplitter is about as dirty as you'd expect for a device that was clearly sitting around for a long time before appearing in an estate sale. There's a lot of dust, plus a small smear of unidentified stuff, almost all on the top surface which is unsilvered. 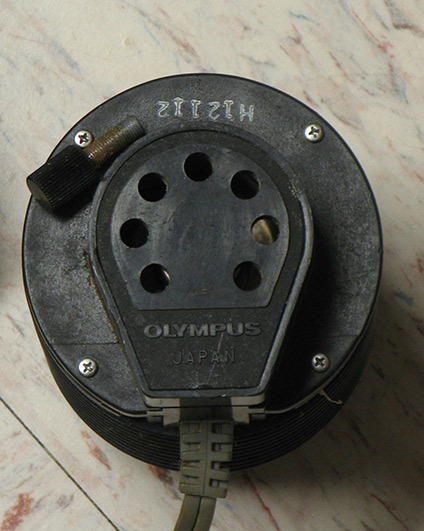 The manual says to call Olympus service if this thing needs cleaning, but of course I'm not inclined to do that. Any hints on how to clean the beamsplitter without damaging it? I once had a Unitron Rollscope go through here. 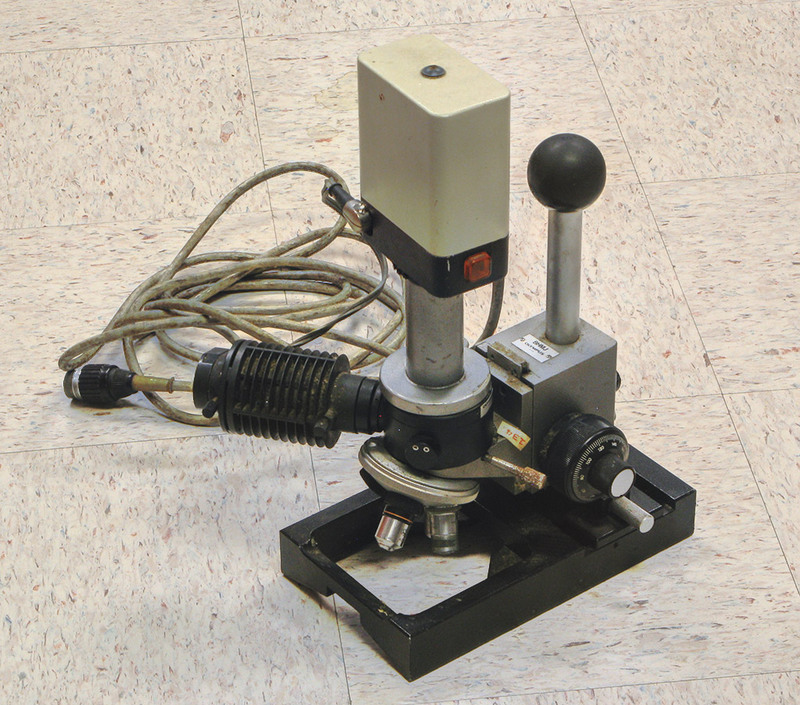 These things are also used for inspecting welds and more recently for inspecting aircraft composite structures. I would flush the mirror with alcohol and leave it at that. The one in the link above is missing its lamphouse which goes into that orifice sort of facing the camera. The batteries live inside the rollers. The one I had did not have the X-Y movement. It was an RM1. Thanks. I suppose isopropyl is OK? Any special concerns about the silvered side? See if you can get a fresh bottle of anyhydrous ethyl alcohol. Most IPA is like 91% with the balance water. A little moisture probably won't bother it anyway if it has already had a "hard life" as is often the case with industrial microscopes. Maybe have a hair dryer or heat gun on low to drive off the moisture and alcohol after you do the deed. You might try an evaporation test on a micro slide to make certain the alcohol has not residue dissolved. I think Edmund sells silvered cover slips these days and pellicles. There are some coatings that are cleanable such as with clear overcoats but there is no way to know whether that unit is new enough to have such a cleanable coating without trying it. If it is bad enough there may be little to lose. If it is bad enough there may be little to lose. It was bad enough. Flushing with alcohol mostly just made a mess. Finally I disassembled the beast and cleaned both sides of the beamsplitter with a large handful of cotton swabs and lots of ROR / Residual Oil Remover, working under a binocular scope with reflected illumination. That finally gave a clean beamsplitter, which works fine. on google books you can read some pages, sounds very interesting for problems like you had.